Change is in the air as Day 5 of 30 rolled around. With a high around twenty degrees cooler today and the wind blowing there was some change in weather. There was a possibility of snow in the metro area, however I did not see any this morning. As I headed out to Lakewood Heritage Center I was glad I had a jacket in the car as it was quite cool due to the wind. When I first arrived the sun was behind a band of clouds, but noticing a large opening in the western sky above the mountains I waited around 45 minutes and was rewarded with some nice afternoon light. The building below is the beauty salon/variety store which is an art deco style and was moved to the present location from Alameda Avenue. Be sure to stop by tomorrow for Day 6 of Thirty Days 2008. 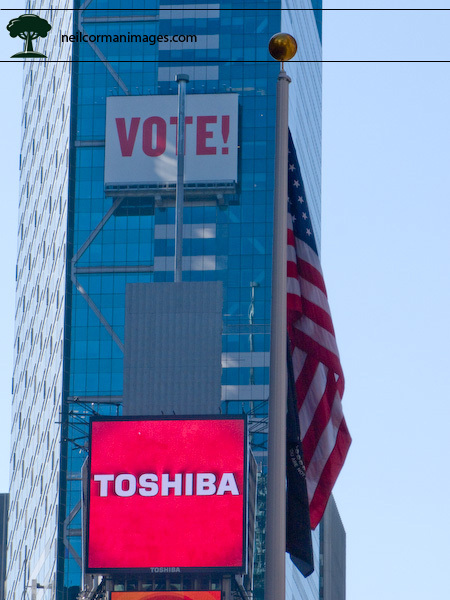 As everyone knows by now, it is election day in the United States. Not only is the country going to the polls and voting today, but the rest of the world is watching as well. Since it is election day it made perfect sense to have that as a tie in to today’s Thirty Day photograph subject. This year my voting location is about 100 meters from my house, however as I normally do I requested a mail in ballot this year for the election. This is something I did all the time while on the road for work, and it just is easier to vote at home. Not too much going on at the voting location for 3 precincts in my area, but it was a stream of people going in to vote about every couple of minutes. 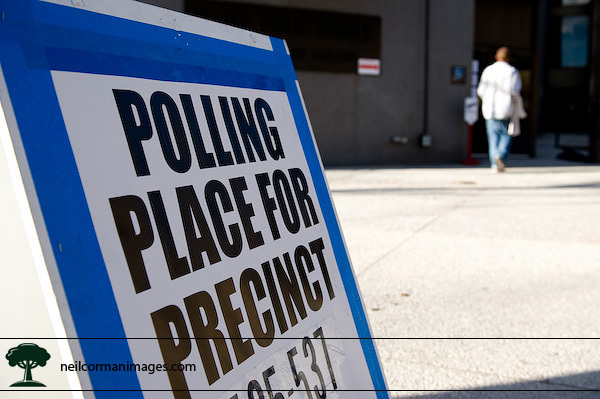 Here is an image of the location, and one of those voters. Check back tomorrow for Day 5 of Thirty Days 2008. One single word should be used today if you haven’t done so already through the early options in your state… VOTE! The following image I captured just over a week ago in Times Square while in New York City. Be sure to come back for the 30 Days-Day 4 image later today. Another mild fall day was present on the front range of Colorado today. With the nice weather I grabbed my camera and walked from my house towards Governors Park looking for an image this afternoon. 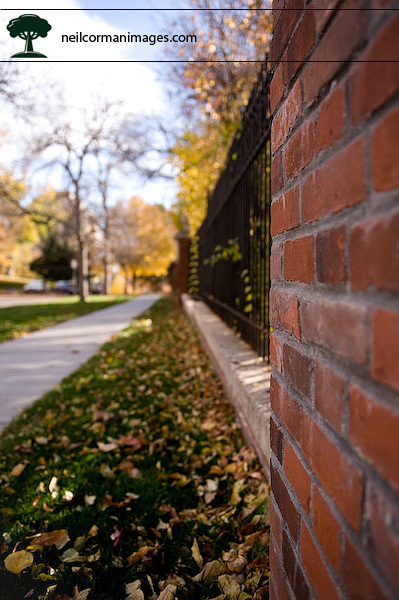 Just prior to reaching the park, I noticed the color of fall and the red brick of the fence around the residence of the Colorado Governor. 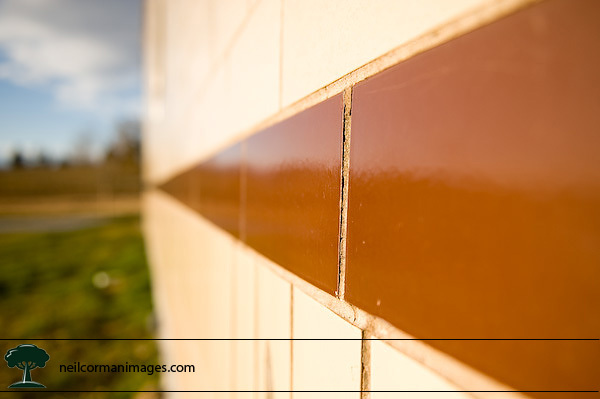 With a minimal depth of field selected I focused on the bricks and took an image down the length of the fence. You may notice the leaves still on the trees, however by the middle of this week I think they will all be on the ground. The wind was blowing a little, but a blast of cold air should be hitting the state on Wednesday into Thursday and with the change in temperature as well as the chance of rain the colors will finally be off most of the trees. Be sure to stop back tomorrow for Day 4 of Thirty Days 2008. Civic Center Park in Denver sits between the State Capitol and City & County of Denver building right next to downtown Denver. The park itself serves as a location for large events including the Taste of Colorado, People’s Fair as well as the largest Cinco de Mayo celebration in the US. With it’s location and the many events which takes place during the course of the year it is a center piece of Denver and helps identify the city. 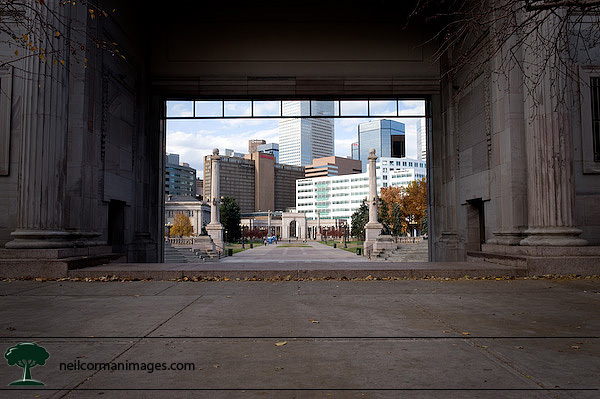 The image for today is was taken at Civic Center Park as I was walking near the Greek amphitheater I found downtown perfectly framed by the park. Knowing the numerous events taking place at the location and how it is tied into downtown this really describes how the park is part of Denver. Be sure to stop by tomorrow for Day 3 of Thirty Days 2008. The first day of the Thirty Days 2008 project had me heading downtown near the Denver Convention Center. I started walking around with some images in mind however clouds had moved in on a warm fall day. Without any late afternoon direct sunlight I shifted gears in my mind and captured the following image at the Convention Center. 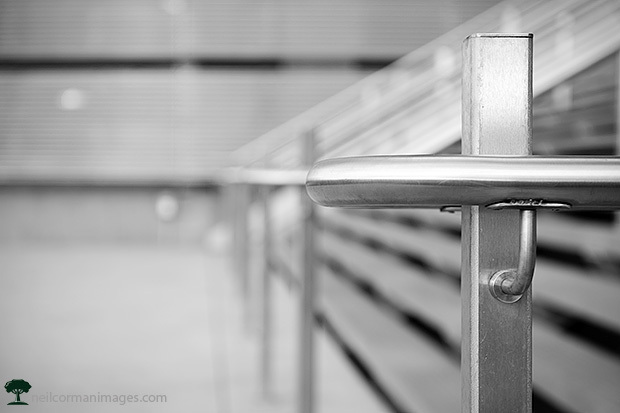 Using an aperture of f/4 for this image I was able to bring the focus onto the first railing as the line of others fall out of focus in the background. As the side of the building is also metal in this area, I wanted this to blend together. Since there was minimal color in the image, I converted the image to black and white using Adobe Lightroom. Check back tomorrow for Day 2 of Thirty Days 2008. The month of October was a busy one for traveling with a week spent out west and then a recent trip to New York City as talked about on this blog in the past couple of days. 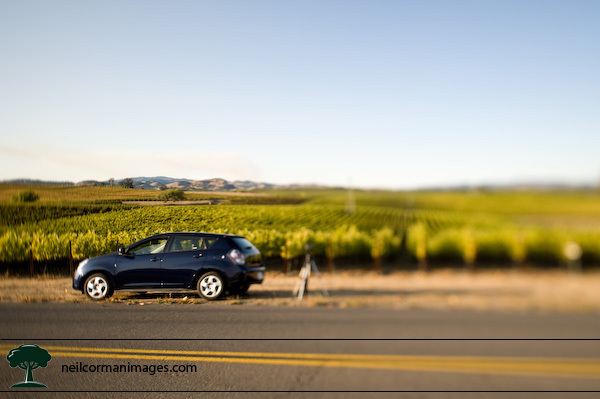 While I was in Northern California, I had the opportunity to have a tilt/shift lens with me. 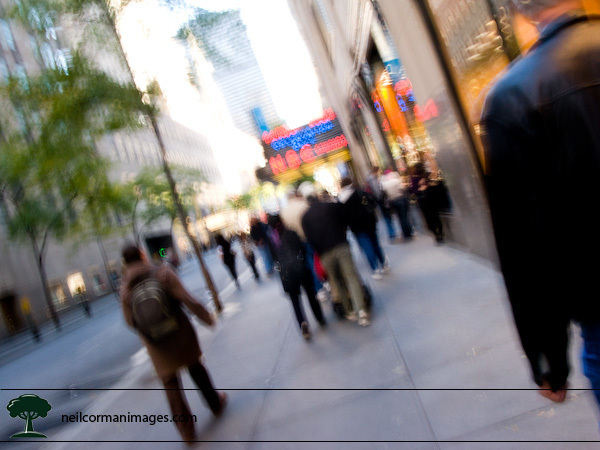 In basic terms, tilt/shift lens allows you to position the lens in a different plane to your camera. With the shift movement parallel lines are kept straight giving you a natural result on a building as you look up instead of converging lines. With the tilt adjustment you adjust the plane of lens and get a result of everything on a similar focal plane. This allows you to use larger f-stops in landscape photography which is quite useful with wildflowers as with a small f-stop a longer shutter speed results. As some movement may occur with the flowers especially with a slight breeze you start to get motion unless you are able to use a quicker shutter speed. One other effect which is possible is making everyday objects look like minatures with the adjustment of the tilt. 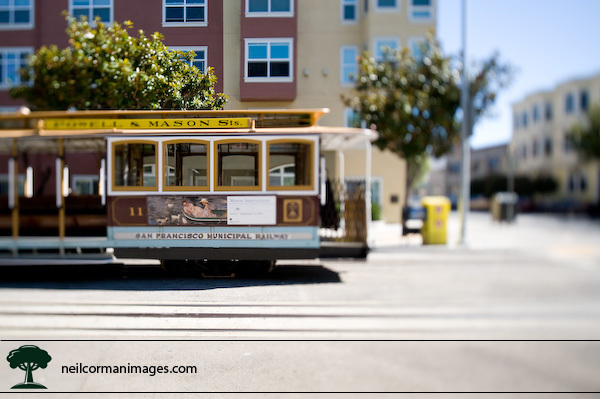 This effect is what I was using while in San Francisco and later in Napa Valley on some images I took during the trip. As I mentioned in my blog post yesterday, last week and into the weekend I was at PhotoPlus in New York City. On Sunday I decided to take the subway to Times Square with my point and shoot camera and take some images. With the Canon G9 (now replaced by the G10) you do get some controls and for these images I decided to shoot in Aperture Priority mode allowing me to control the depth of field. Adjust the aperture as well as the ISO I was able to get some slow enough shutter speeds so when I moved the camera I would get a blur in the scene. 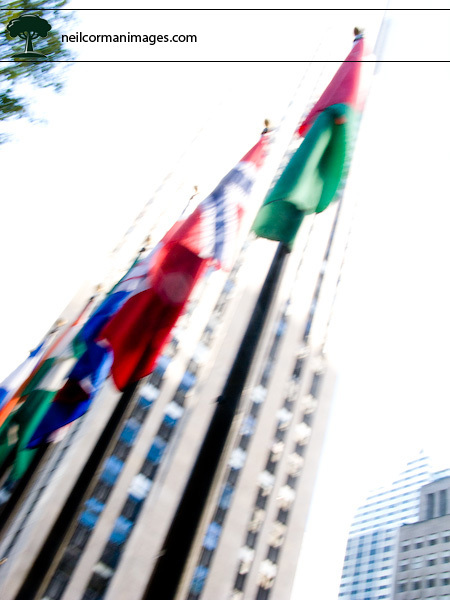 Some of this involved tricking the meter, which leads to the blown out highlights especially in the image of the flags in Rockefeller Plaza. Times Square has always hinted towards action with a quick pace and the neon in the evening. 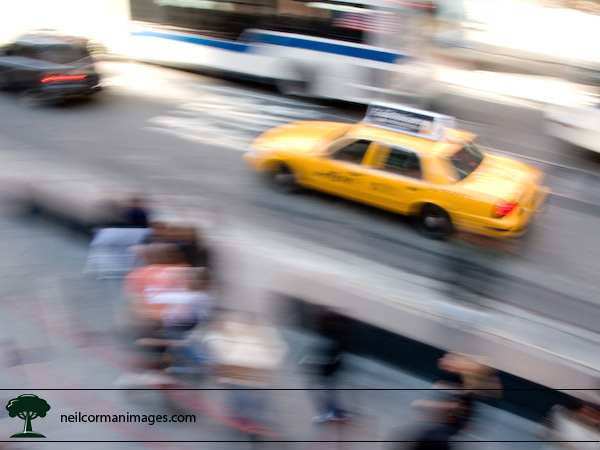 Also on Broadway and 7th Avenue you will constantly see the movement of yellow cabs, but that is also true througout Manhattan. As I headed across 50th Street towards Rockefeller Plaza I noticed a good stream of people heading that way, and as I ate a pretzel on the corner of 50th and Avenue of the Americas I also noted the neon on Radio City Music Hall. At first I was trying to get the people crossing the avenue but the frame just wasn’t working and as I continued down 50th noticed the NBC Studios sign which I figured could work in the frame. The below image was also captured with a slow shutter speed and is not cropped since I thought the position of the closest two people was perfect in this frame and didn’t want to lose that at all. Once I got to Rockefeller Plaza I was looking down at the people skating on the rink and just couldn’t get anything I liked and focused my attention on the flags of all the countries throughout the plaza. With part of the plaza in shadow and the top of 30 Rock in sun I knew it would be tricky to meter so I decided to meter on just the shade and let the sky blow out in highlights. Almost all of the images I took on this day were a little different and tried to stretch the camera abilities to the limits than the normal scenes in New York City. 1. Carson City, Nevada. You can see the new 395 bypass being built around the town as well Washoe Lake north of Carson City. 2. The east side of Lake Tahoe, with Hwy 28 seen snaking through the trees. Today the University of Denver held the Floyd M. Theard Memorial Golf Tournament at Green Valley Ranch Golf Course. The tournament was originally scheduled to be held in September, however it was postponed until today due to weather on the earlier date. Last evening in Denver it rained pretty well, however this morning blue skies with a few clouds was the weather allowing the tournament to take place. During the tournament I was given a cart and roamed the course taking images of the particpants having a good time and enjoying a day of golf. The following are just a few of the many images taken during the event. From just off the green a team chips and tries to get close to the hole. A golfer celebrates as a putt drops in the hole. From off the green a team chips on for a good putting location. A putt drops as team members celebrate.